When you go off campus for business trips, vacations and such, you may wish to set an auto reply on your Outlook (Exchange) email account so that persons sending you a message know you are away. When you do this, please keep in mind the following rules of the road. 1. Only activate auto replies for internal (inside) messages. 2. If you must activate auto replies for external (outside) messages, only reply to persons you have in your personal Contacts list. You may wonder why you should not simply reply to all messages. This is because replying to most external messages tends to have you replying to every “spam” message that comes your way, which is something you would not normally do if replying by hand. With the number of Web 2.0 services available now days, this also affects how you reply to “daily reminders” such as are sent out by Yammer, Twitter, FaceBook, etc. You certainly do not want your auto reply to flood these services on a daily basis while you are gone. 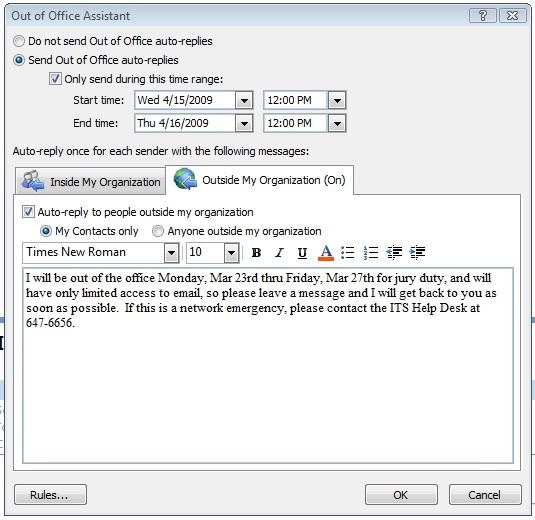 To set up an auto reply under Outlook, you simply go to the Tools menu and choose Out of Office Assistant…., and then make sure you have checked My Contacts Only under the Outside My Organization tab (see below). Note: The above screen may look different depending on your version of Outlook or Entourage, or if you are using Outlook Web (set auto reply under Properties when using http://mail.middlebury.edu ). If you plan to be gone from your office for only a short period of time, and have access to your email while on the road, you should consider not turning on the auto reply for any outside mail at all. In any case you should never choose Anyone Outside My Organization when auto replying to messages. Happy trails…. What do you do if you’re in recruiting/admissions/financial aid etc and often get emails from prospective students who are not in your contact list? I contacted yammer about the problem and I think they have or will be fixing the yammer problem. As I have a similar concern to Lynn’s–I receive many work e-mails from people not in my contact list–I wonder if it is possible to set up an autoreply that sends to everyone except specific excluded addresses. E.g., if I know I receive reminder/listserv type e-mails from x, y, and z organizations on a daily basis, can I exclude them from my autoreply but have it sent to everyone else who e-mails me? There is no exclusion list for auto replies. Unfortunately, in today’s spam filled world auto-replies are just not very good with outside mail. This is not a Yammer issue, it is just a fact of life. No email system is smart enough to know which outside emails are ones you need to reply to and which are spam that got through the spam filter. If you must use auto-replies for outside email, you should keep a list of your automatic mailing lists (like Yammer) and then turn off these automatic daily reminders while you are away. This will prevent your auto-replies from bouncing back to the mailing lists by mistake. It is not convenient, but it is the polite thing to do.